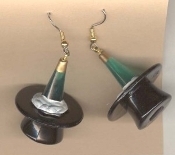 TOP HAT with CHAMPAGNE BOTTLE EARRINGS - Plastic, 3-D Mini CHAMPAGNE BOTTLE in TOP HAT charm. Approx. 1-3/8" high. Great for New Year's Eve, Wedding, Anniversary, Birthday, Graduation, Quinceanera, any party celebration!